The British Go Association (BGA) has recently completed a project to get all issues of the British Go Journal into an on-line archive. Each issue since 1967 is available as a PDF file, with many issues having some of their content translated into web pages. Making article web pages is an ongoing project, and issues will only become available to the general public once they become a year old. There are 148 issues currently available with games and instructional articles for kyu through dan-level players. Early issues were produced on typewriters and used an algebraic notation to describe games and positions. Starting with issue number 4, pictures were added and the web page versions include SGF and GO format game records. News from the local, national, and international go scenes in the issues as well as 40+ years of “internal wranglings” of the BGA provide an amazing resource for anyone interested in go history, or just in improving their game. Jun Tarumi 5d (l) topped a field of 113 players to win the Darmstaedter Go-Tage 2010, played June 5-6 in Darmstadt, Germany. Tarumi was undefeated in the five-round tournament, while Torsten Knauf 4d and Thomas Kettenring 3d came out on top of six players with 3 wins for second and third places. There were 80 kyu level players in the huge field. Valerij Krushelnyckyj 7k went 6-0 to top the field of 19 at the Rivne (Ukraine) Open Championship for those under 12. Vladyslav Verteleckyj 8k was second at 5-1 and Andrij Pylypchuk 11k was third at 4-2. The tournament was held June 5-6. Catalin Taranu 7d (c) swept the finals of the 2010 Romanian Cup to notch his third consecutive title. Cristian Pop 7d (r) went 5-1 to come in second, while Cornel Burzo 6d (l) was one of four with a 4-2 record and came in third. The tournament was held June 4-6 in Pitesti. Lee Sedol 9P (l) ranks well above second-ranked Lee Changho 9P in the Korean Baduk Association’s ranking system’s latest standings. Lee Sedol has 9732 points to Lee Changho’s 9598 points, with Park Junghwan 7P and Park Yeonghun 9D close behind at 9581 and 9580 points, respectively. CLICK HERE for the complete Top Ten list. Kong Jie narrowly defeated Yoda Norimoto by half a point in the first round of the 15th LG Cup, and Lee Changho (at left in photo) defeated Wang Xi by resignation after 231 moves. 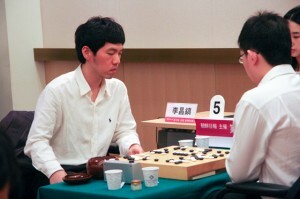 In a major victory, Gu Li defeated Lee Sedol by resignation after 291 moves; Gu has been in a slump lately, and his win was a major defeat for Lee Sedol who was the favorite to win this year’s LG Cup. 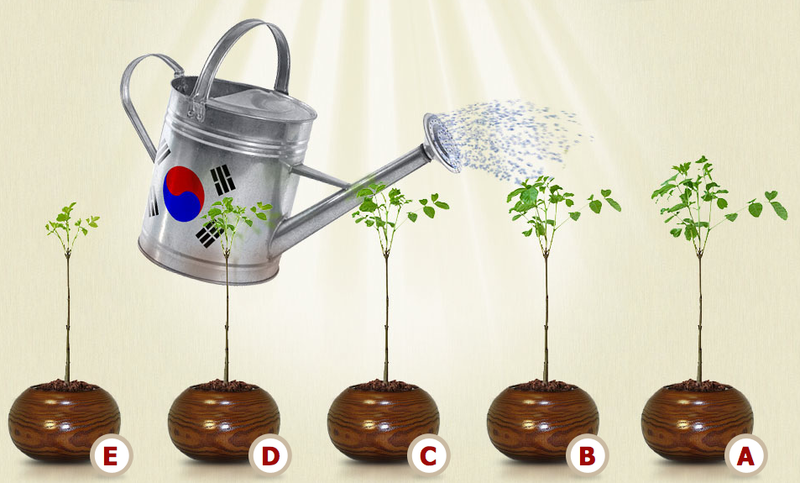 After the dust settled, China emerged with a commanding 11 out 16 wins in the first round, while Japan and Taiwan were eliminated, leaving Korea with the remaining five wins. The second round will be played on June 9th. The AGF’s youth go website Tiger’s Mouth have put together a 20-member dream team to challenge Alexandre Dinerchtein 3P and his Insei League, who have been taking on all comers on KGS recently. 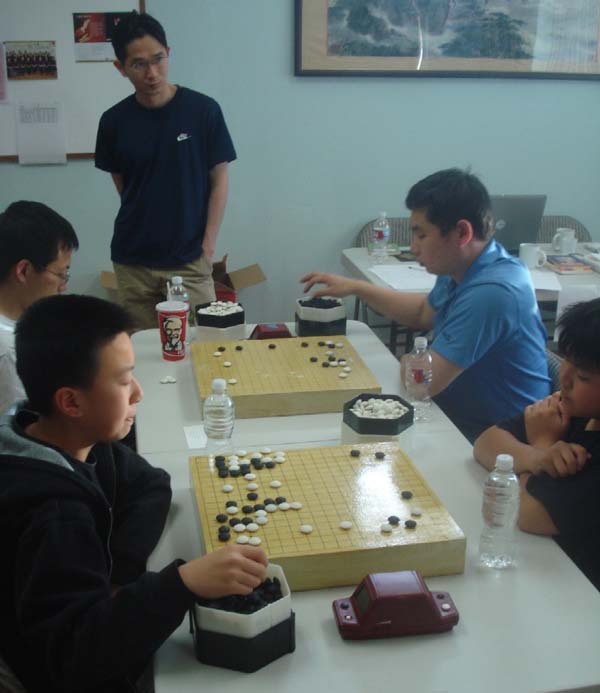 The Insei League allows KGS players anywhere in the world to take part in a professional go school taught by Dinerchtein and other Korean Professionals. The Inseis crushed the British Go League team 7-3 on May 22nd, followed by a 10-3 rout of the Russian National Female Team (in which 2 of the 3 winners were also members of the Insei League as well as Russian nationals) on May 30th. Poland fought back in style on June 5 though, finally stopping the Inseis 13-7. “Your team will be the next one we beat,” said Dinerchtein, known as Breakfast on KGS, when he challenged the U.S. recently. “Not so fast Breakfast,” responded the AGF’s youth go website Tiger’s Mouth, who put together a 20-member dream team to challenge the Inseis. Team Tigersmouth has star youth players Curtis Tang 8d and Gansheng Shi 8d, plus Calvin Sun 7d, ten more dan level kids, and 7 kyu level players. The stage is set for Sunday June 13th in the AGA Tournaments room on KGS, at 10 am west coast time, observers are welcome. Pairings will be available shortly before the match here, Tigersmouth team info is available here. Canadian youth have all but shut the U.S. out of the Redmond Cup this year, with Jianing Gan 6d and Gansheng Shi 8d winning the Senior Division, and Oliver Wolf 2d and Henry Zhang 1d winning the Junior. Zhang is the only one of the three from the U.S., he is also the younger brother of former Redmond champ Hugh Zhang. All four youth have won a free trip to the US Go Congress, where they will play a best two-out-of-three match with their opponent, and split a $1,000 prize pool courtesy of the AGF. The Senior Division, for youth 12-17 years old, had 27 youth competing and featured U.S. stars Curtis Tang 8d, Calvin Sun 7d, and Zhongxia Zhao 7d among the top players. Leading the pack was two-time Redmond Champion and current title holder Gansheng Shi 8d. Shi has a simple but effective strategy: he just wins, all the time. Tang or Sun were both favored in this event, but it was fellow Canadian Jianing Gan who pulled out all the stops to place first. 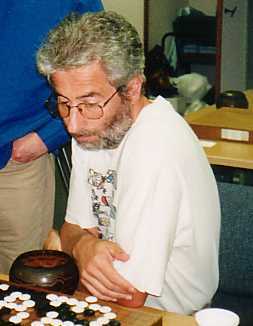 He was the only player to beat Shi, each losing only one out of their seven games. Gan, just 13 years old, will be familiar to E-J readers as the challenger to Myungwan Kim in the SPOT1 finals recently. In the Junior Division, nine kids, all under the age of 12, duked it out for top honors. Ten-year-old Oliver Wolf had the top record, with four wins in five games. 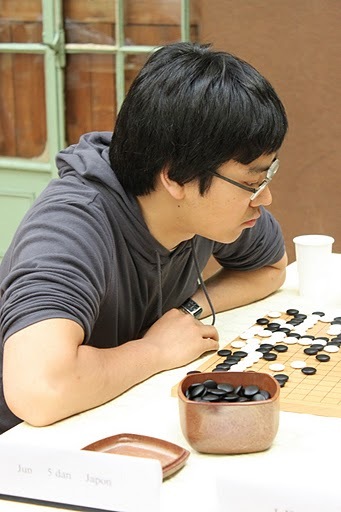 Four players had three wins, but Henry Zhang had the best SOS (Sum of Opponents Scores) record, and also was the only player to beat Wolf. The Redmond Cup, now in its 17th year, was directed by Michael Bull. - Paul Barchilon, EJ Youth Editor. 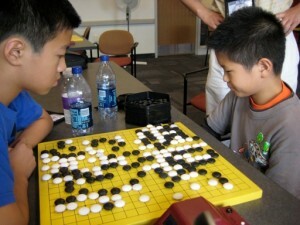 Photo: Yunxuan Li (l) vs. Jerry Shen (r) in 2009 Redmond finals, Jr. Division.